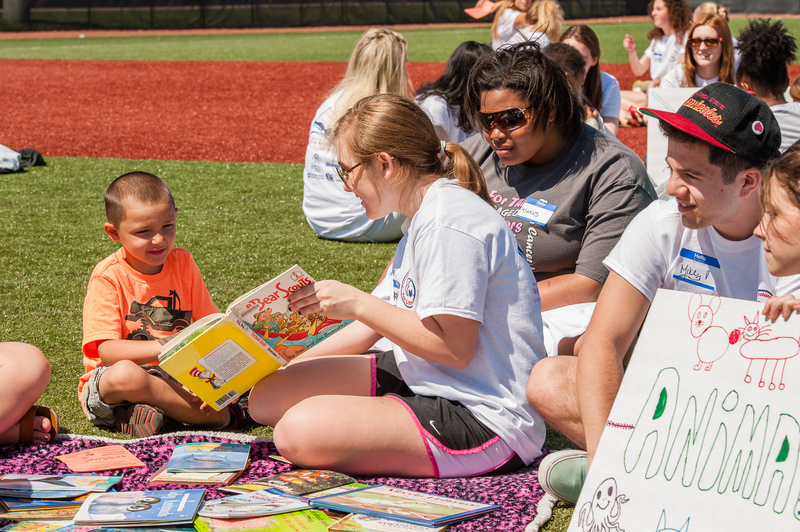 On Saturday, April 11, more than 140 Belmont students came together at Rose Park to celebrate the University’s 15th annual Family Literacy Day. Held every year, the event invites families from the Rose Park neighborhood to read with Belmont students to promote literacy throughout the community. This year, more than 160 community members registered for the event, doubling numbers from last year’s celebration. Belmont’s Director of Service Learning and event organizer Tim Stewart said Family Literacy Day began as part of a grant that has funded and spurred the creation of many other events that encourage literacy throughout the Nashville community. “The fact that we’ve been doing Family Literacy Day for so long is a strong testament to Belmont’s desire to encourage children and families in our community to read. It also provides a great opportunity for our students to give of themselves to brighten the lives of others,” Stewart said. Student organizations, campus departments and individual volunteers created reading groups, centered around a theme, and invited attendees to join their station for a book or two. Inside the Easley Community Center, students could participate in a variety of activities, all centered around celebrating reading. Activities included a free book “store,” poetry contest, book cake walk, reading crafts, face painting and Dr. Seuss games. This year’s event also included a participation incentive – the more the children read, the more stickers they received. The stickers were used inside the Center to participate in games and activities. The incentive was introduced to encourage attendees to enjoy the day and its festivities. While the event is organized by Stewart and the Belmont Volunteers for Literary student organization, a number of organizations joined efforts this year to partner with the team. Delta Kappa Gamma, a local sorority, brought a group of teachers who hosted a costume-based reading circle, the Nashville Adult Literacy Council sponsored a booth to provide resources for parents, Book’em provided free books for participants and three Belmont faculty members incorporated the event into their courses as a service learning component. For more information on the event and the Belmont Volunteers for Literacy organization, click here.